The suspense is relentless in this believable, tense and superbly acted war drama. 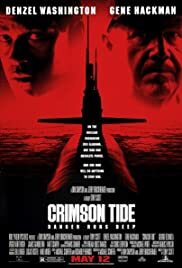 One of the best modern war movies I have seen, Crimson Tide is a story about strained loyalty, respect, command, discipline, power, and military practice. 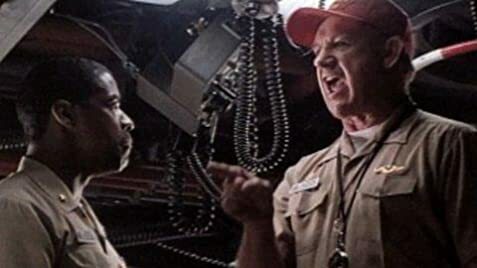 Hackman and Washington are perfectly cast as an older battle-hardened nuclear submarine captain and his younger, less experienced but highly educated executive officer, caught in a crisis of potentially world-threatening proportions. Pursued by an enemy submarine, the USS Alabama has nuclear warheads aimed and ready to fire as a pre-emptive strike against a Russian rebel commanding his own nuclear arsenal. The Alabama is commanded to launch, and begins preparations, but the enemy sub attacks, knocking out all communications just as a second command is being received. The nature of that second command and what to do about then becomes the key problem that the Captain and XO have to deal with. Suffice to say, they do not agree on how to proceed, and the remainder of the film is a struggle between the two men and those who support each, in a crippled but still lethal sub, with the fate of the world hanging in the balance. What's is amazing about Michael Schiffer's story is its plausibility. The basic scenario upon which the script is based could happen. The cast - all of them - are spectacular, and the directing is masterful. Although some of the behavior of the men aboard the Alabama seems improbable at times, given the military realities of chain of command and discipline, the sheer performance power of this film's cast and production team make it all seem very real and extremely compelling. the characters are HUGE, complex, and real. More than just a cautionary tale, this is a very human drama about who people become under extreme conditions, and how they work out problems to reach solutions, or fail to do so. If that final sentence sounds cryptic, then let it entice you to see the film so you can figure out what I mean for yourself.